That’s all we have to judge Tony Romo on from the 2016 season. Five passes. But they just might be enough. Ryan Pace and John Fox are feeling the pressure to win now and they may have a chance to sign a quarterback who was considered among the best in the league for a decade. Even with Romo’s injury history, it’s something Pace and Fox are going to consider. The thing about those five passes is they were all really good. They were sharp and on the money. One was a 15-yard spiral on third-and-11. Another was a deep pass that would’ve been a touchdown if not for an interference penalty. Romo finished his only drive of the season with a beautifully accurate touchdown pass, displaying a touch that very few quarterbacks have. Romo looked very much like the guy who probably should have won the 2014 MVP award. Forget about possibly trading for Romo. No team is going to take on that contract and the Cowboys shouldn’t ask Romo to go to the highest bidder. If he hasn’t already, Romo is going to talk to Jerry Jones and ask him for his release and they’ll work something out. 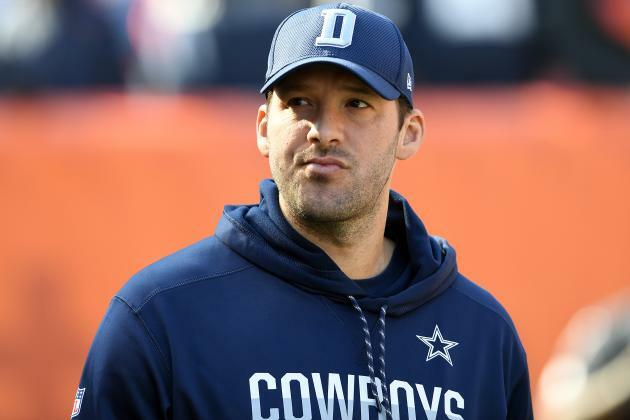 Romo will then be able to pick his next team and the Bears will be somewhere on his list. The connections between the Bears and Romo aren’t hard to make. Pace and Romo were teammates at Eastern Illinois. Fox has been in this position before as the head coach of the team that signed Peyton Manning after 12,500 neck surgeries. (Pace’s former employer, the Saints, also signed damaged good Drew Brees after multiple shoulder surgeries.) The Bears brass can also offer both a starting gig and good chunk of change next year. Surely, Romo would rather sign with a playoff team, but convincing him the Bears will be a playoff team with him won’t be hard. Look at the Cowboys. They went 15-4 with Romo starting in 2014 and 2015 and 1-12 without him. When the Cowboys got a good quarterback in Dak Prescott, they were good again. The quarterback can make a bad team really good and Romo knows that as well as anyone. As long as they keep Alshon Jeffery, the Bears have a lot to offer any quarterback. They have three young, big and athletic receivers, an offensive line that can keep him clean and the second-leading rusher in the league. They also have a head coach who is going to let Romo do his thing. If Matt Barkley and Brian Hoyer can throw for 300 yards, what could Romo do? But he has to stay healthy. Availability is one of the things Pace highlighted when he spoke about trying to find a quarterback. There’s no denying that is Romo’s biggest issue. He wouldn’t even be available to other teams if he was available to the Cowboys this season. It seems like he breaks a bone every time he gets hit and there’s no evidence that he’s still physically capable of avoiding a pass rush. Romo might crumble in the preseason and the Bears would be left without their stopgap. And, really, we don’t even know if Romo can still play at a high level. He’ll be 37 in April and old quarterbacks tend to not be good quarterbacks. The last time we saw Romo play more than just a few snaps, he threw five touchdowns and seven interceptions. He threw two or more interceptions in three of the four games he appeared in. His passer rating in 2015 was just 79.4. In a lot of ways, his 2015 season was like Jay Cutler’s 2016 season. So why not just stick with Cutler? Because Romo’s best is way better than Cutler’s best. Before 2015, Romo had a four-year stretch in which he averaged 31 touchdown passes and 4,155 yards. Moving from Cutler to Romo would be based entirely on a leap of faith. If Romo can still be the guy he was in 2014, he’s one of the five best quarterbacks in the entire league. Nobody, not even Romo himself, knows what he has in the tank. It’s about risk vs. reward. If he can’t play, the Bears will lose some money, but little else. If he can play, they could have an MVP-caliber quarterback.